The British Ladies' Football Club was an all-woman football team formed in the United Kingdom in 1885. The team had as its patron Lady Florence Dixie, an aristocrat from Dumfries, and its first captain was Nettie Honeyball (real name likely Mary Hutson). The club's first public match took place at Crouch End, London on 23 March 1895, between teams representing 'The North' and 'The South'. The North won 7–1 in front of an estimated 11,000 spectators. Until the 19th century, women's participation in football was limited to folk rituals linked with marriage customs. In Inverness, for example, single women would annually play a match with married women, whilst prospective husbands watched from the sidelines. 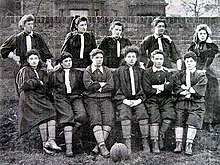 The first record of a woman's team coming together to play football occurred on 9 May 1881, at Edinburgh's Easter Road Stadium. The match was billed as a Scotland v England international and featured Mrs Graham's XI. Just over a week later, on 20 May 1881, the teams played in Glasgow in front of a crowd of 5,000. This match had to be abandoned following a violent pitch invasion during which the women were "roughly jostled", and chased by a mob as they left the grounds. Further games resulted in similar pitch invasions, which soon resulting in ending this early attempt to introduce women's football. It is uncertain, from the coverage of the time, what the pitch invasions were in protest against. However, the press tone, which would dominate coverage of women's football for the next century, was clearly established in 1881: barely disguised contempt regarding player appearance, including costume, and the standard of play, overlaid with a certainty that football was a rough man's game unsuitable for women. An attempt to form a new club was made by Alfred Hewitt Smith with Nettie Honeyball as the figurehead for the British Ladies Football Club founded on 1 January 1895. Lady Florence Dixie, the youngest daughter of the Marquess of Queensbury, acted as chairman and sponsor. In 1894, an advertisement was placed in the Daily Graphic seeking those interested in forming a football club for women which attracted around 30 women, who trained twice weekly under the tutelage of Tottenham Hotspur wing-half Bill Julian. The club divided into a north and south team and on 23 March 1895, 10,000[notes 1] spectators watched the inaugural game at Crouch End, London. Unlike in the matches of 1881, players no longer had to wear corsets:xvi and high-heeled boots, but acquired standard man's boots in suitable sizes. They still had to wear bonnets, with the game being stopped if any woman headed the ball and it dislodged either bonnet or hairpin which had to be replaced before the game could resume. The reaction was generally one of being heckled by the crowd, and press censure, bordering on derision. Despite this, the club went on tour, sponsored by Lady Dixie, and in the following two years played some 100 exhibition matches. The tour attracted great publicity from the press, though not entirely restricted to the sport as, at the time, women playing football was intricately linked to the 'Rights question'. The strain of playing so often took its toll, and by September 1896 the ladies could only field a few players. They were also broke, and arriving in Exeter found they had insufficient funds to either leave or pay their hotel bill. Appeals to the mayor of Exeter fell on deaf ears and he refused to pay. The ladies had to be rescued by friends, and the activities of the club came to an end. Women's football once again fell into obscurity until the First World War, when Lloyd George required women to work in factories whilst the men were at the front. On Christmas Day, 1916, the first recorded match between factory organised women's teams, occurred in Ulverston, Cumbria. ^ "The Honeyballers: Women who fought to play football". BBC News. 26 September 2013. Retrieved 17 February 2015. ^ a b "Ladies' Football Match". The Standard. London. 25 March 1895. Retrieved 17 February 2015 – via British Newspaper Archive. (Subscription required (help)).